2 BR/2 BA Tampa Bay, nice location and view. Renovated condo surrounded by conservation area overlooking Old Tampa Bay. Attractively furnished, bright interior with wood floors in living and dining areas and carpet in bedrooms. Two BR with queen sized beds, 2 full baths, 3 televisions with cable service, wi-fi and free calling within the US. All amenities... an excellent central location close to stadiums, Busch Gardens, Lowry Zoo, with short drive to west coast beaches and an hour's easy highway drive to Orlando. Close by, Ben T. Davis beach is a five minute drive; Rocky Point Gulf Course three minutes away. Many cultural opportunities in the city of Tampa, including the Straz Performing Arts Center where there are wonderful performances. There is a pool, clubhouse, and fitness facility; also a railed boardwalk and gazebo so you can walk over acres of this natural Florida setting. Spectactular sunrises and sunsets, views of cityscape and Bay. Working for The Weather Channel, I knew that great weather was #1 on a vacation -- and Tampa offered that plus so much more! We are always so busy when there...and then there are some days that are just perfectly lazy ones at the beach (The Don CeSar Resort is a beautiful place to spend the day). We've been to Busch Gardens several times and they always have a different theme so it is a new experience with each visit. The performances are actually great! The condo is minutes away from the airport but quiet....with a distant view of the waters of Old Tampa Bay. It is a good central departure location, and you can be at the beautiful Gulf Coast beaches in twenty five minutes at the most. Close by, some of the attractions include Busch Gardens, Ybor City, Lowry Zoo, Honeymoon Island state park and Raymond James Stadium, Steinbrenner Field. Heading east, Orlando's DisneyWorld, EPCOT, MGM, SeaWorld and Lake Buena Vista can be reached in little over an hour, so you definitely get to see a lot of Florida in a short time. 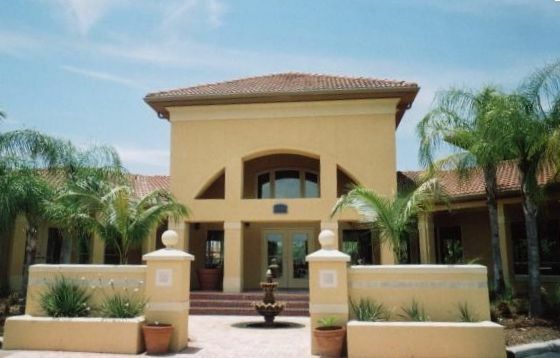 There is an elevated walkway over the conservation area...it is good for a nice walk or jog where you can finish up back at the pool/clubhouse/fitness center. Close to malls, restaurants, Publix shopping and many different restaurants. Our favorite is Columbia in Ybor City! (3) high speed Internet connection in unit; computers available for use at clubhouse as well. Thank you, Kathy! Our stay was very nice and I don't believe there is another homeowner that is easier to work with. She is very easy to reach and quick to respond. The condo is comfortable, well equiped and we loved having the 2 bedroom split floorplan for some privacy and the screened in balcony when the weather cooperated. The location is convenient and it's very easy to get to the airport or beaches or if you just need groceries. The condo overlooks the nature preserve and has a nice view during the day or night. We have moved to the area, but if we need some extra space for visitors, we will definitely recommend this condo and Kathy! Thanks again for all you did to make our stay perfect and we know we weren't the easiest people to work with. You helped make a stressful time, less so. Thank you! We were so happy that you chose our condo to stay during this important time in your family's life. Wishing you all the best success. I came to this condo with some health concerns. Wow. This condo was great. Kathy went above and beyond to ensure I would not get sick. I can’t say enough about Kathy. Thank you! I hope you are doing well. God bless! Lovely condo, great location. Kathy was available and attentive to our every need. Will definitely stay again when in area. We enjoyed our stay here, and the condo was very well equipped. The condo was very clean-spotless!! Kathy was very responsive if we needed anything. The nicer beaches are a pretty good drive, just be aware of this. We had wonderful weather and had a nice time. Thank you, Laura! We are glad your family had a good time. Yes, the beaches on the Gulf of Mexico are the best, so we always make it a full day. .
Not as clean as we would have expected. Water pressure poor in shower. Should have had a set of utensils rather then a mix of knives, spoons and forks. We are sorry to hear of your disappointment, and are surprised. In twelve years, we have never had a less-than-excellent review so this is confusing to us. For example, we did "seasonal" cleaning ourselves and then engaged Sears Carpet Cleaning for a quarterly service on the 3 year old carpet just 2 days before your arrival. We also had our professional cleaning service come in the day prior to your arrival. Our plumber advises the shower pressure is adequate, considering Tampa's high mineral content in water. Mattresses were expensive and people having back surgery at the Spinal Center have judged them comfortable in the past. Utensils were usable --but we did just purchase a new perfectly "matched" set. The location is perfect--close to everything, yet quiet area. Very close to the airport and downtown, but without the noise. The condo if very well equipped including some cooking spices you might need, but don't need to use a lot of. There are clear instructions throughout the home. Beds and furniture were very comfortable. When we did have questions, Kathy was very responsive. There is a nice boardwalk that is accessible from the back of the development. That makes for a nice morning or evening stroll. People were friendly. My only issue is with the garbage collection. Although pickup is every day, but 2 days per week, the first time they came they did not take what was IN the box. The 2nd time, they took the garbage, but left the recyclables. It would be nice to have a dumpster where we could simply remove the trash ourselves. (This is certainly beyond Kathy's control, but it is a little confusing.) This is the only reason for 4 out of 5 stars. I would definitely stay here again. Thank you! I am glad you had a nice time while in Florida. For longer stays or for military families, we will discount our rates. Winter rentals require a 90 day advance notice of cancellation. The rest of the year, normal timeframe is ok.